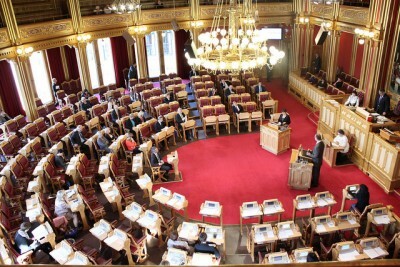 Members of Parliament from both parties in government have sent a list of seven demands that they think organizers of a Winter Olympics (OL) in Oslo should make to the International Olympic Committee (IOC). The demands likely will be need to be met, in order for the government to agree to ultimately be responsible for covering the huge costs of an Oslo OL in 2022. The IOC has already sent thousands of pages of its own demands to the Oslo2022 committee, which must send its formal application to host the Winter OL by next Friday, March 14. Now the government parties, faced with strong nationwide opposition to the OL project because of its costs, have some demands of their own. ** Apart from what they call “good Norwegian hospitality” and necessary access and security measures. the government politicians believe that the costs of IOC members’ own accommodation during the OL weeks should be covered by the IOC itself. ** The two government parties think the Oslo2022 committee must demand that limits be placed on any additional competitive events within the Olympics. Critics have claimed the Olympics have become much too big, with too many new sporting events added in recent years. The Norwegian politicians think that development should be brought under more control. ** They also want to see more use of existing sports facilities in and around Oslo, to control costs and reduce environmental impact. ** The rights of workers called in to build new OL facilities must be guaranteed, they wrote. This demand comes in the wake of criticism over how work was carried out during construction of Olympic facilities in, for example, Beijing and Sochi. ** A Norwegian application for an OL must emphasize how inclusion, equality and respect for human rights would be the foundation for how an OL would be arranged. ** The athletes should at all times be at the center of attention during the Games. ** The Oslo2022 committee should develop cooperation with plans for the Youth OL that will be hosted back in Lillehammer before a 2022 Olympics. Given the recent wave of criticism against the IOC, and the IOC’s need to find willing hosts for future Olympics, the Norwegian politicians clearly feel entitled to make demands of their own instead of just the other way around. State politicians ultimately hold the pursestrings on behalf of Norwegian taxpayers, and the entire project now hinges on whether the Norwegian government and Members of Parliament will put up the money. They must decide on that by January. Meanwhile, the application process appears likely to move forward despite strong public opposition to the project nationwide. Oslo2022 has an official budget of around NOK 35 billion (around USD 6 billion) at present, but given the track record of Olympics actually costing four times their initial budgets, at Sochi in Russia this year and also at Lillehammer in 1994, most expect that a Winter Olympics in Oslo in 2022 will cost much more. The sheer expense is what’s fueling the debate and opposition, with a majority currently calling on the politicians to reject the request for a financial guarantee, according to public opinion polls.